TM Bharati Ramineni, Hyderabad Toastmasters Hello Team! Appreciate your efforts in bringing out such an interesting newsletter. I thoroughly enjoyed reading it. Especially about Milind Soman and the cover story ( I'm a big fan of Aditya :-) . It helps to know that behind their success there is courage, planning and hard work. Wish you all the best! TM Pritpal Kaur, Palava Toastmasters Club, Mumbai (yet to charter) I thank you for sharing this article. DTM Aditya M is indeed an inspiration for budding toastmasters like me. His vision to use public speaking as a platform to inspire people to find their potential is commendable and I wish him all the success in this. This article has encouraged me to find my style for public speaking and not just copy paste what other great leaders do. His take on keeping his speeches simple and not sensational is very wise. Indeed, Simplicity is the ultimate Sophistication. TM Rajiv Vassanji, Amdavad Toastmasters Club Very inspiring article which demonstrates the true power of faith and believing in your abilities when others don't. Well edited, thoughtful questions, succinct answers, and above all a relevant topic Being entrepreneur and keeping social purpose in mind. TM Kumar, Palava Toastmasters Club, Mumbai (yet to charter) Milind Soman, the ageless Greek God of fitness, continues to inspire many of us to take care of self and the community as a whole, leading by example and through various initiatives such as those mentioned in your article. A truly passionate person need not look for any support or backing, it follows wherever they choose to lead is demonstrated by milind in this article. May you run many marathons in the pink of health.. Thank you Soman thank you So much. TM Vinay Prabhu Mhambre, Mapusa Toastmasters, Goa Lowell.... a good friend ... very good human... and the best speaker.... you are the motivation for most of us... I still remember the warmth you showed on the first day I came for the Toastmasters meeting and your passion for Toastmasters.... I am proud of being in the same club as you... and yes for rest of you all... Lowell has been our Area Champion at the humorous speech contest and the first runner up at the Division Level... Keep speaking and keep motivatingâ&#x20AC;Ś TM Mayuri Assudani, Nagpur Toastmasters Club TM Lowell, more power to you and kudos to your club members who encouraged you at every step. Recently at the Absolutely Toasted Toastmasters Club in Vancouver, I saw the same kind of encouragement and appreciation for a young man who too stuttered and stammered. But I saw his confidence level during speeches, as TMOD and as Topics Master. Needless to say, the Toastmasters Club is that one place where one is never discriminated but rather is pushed to do the best to one's ability. All the best for your future projects! 23 WELCOME TO THE FAMILY! District 98 may only be three years old, but we’ve grown rather fond of our conferences. They represent the epitome of the skills we celebrate in Toastmasters. Contestants battle it out to be crowned public speaking champions while leaders are made in making it all happen. Confluence, our semi-annual District conference, has always been my special favourite. Kicked-off from Hyderabad in 2015, Confluence brought with it all the creativity of a newly minted District, unveiling a mascot (go Toastie! ), slick PR slogans, and a unique un-conferencing concept. The conference moved to Goa in 2016, where the hospitality, enchanting venue, and the charm of surf and turf enamoured us all. Now, as TI makes a decision to discontinue this beloved gathering of kindred spirits, the swan song of Confluence will be at Indore in 2017. What a conference feels like lies entirely in the hands of the convener. This is the person who sets the vision and leads the team to execute it. 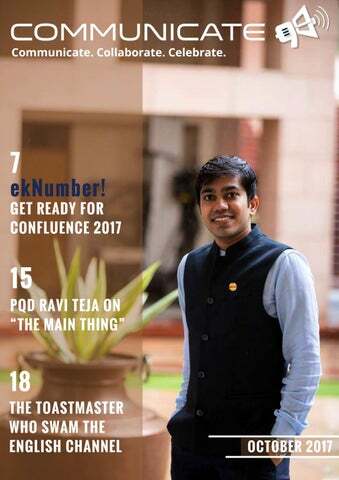 We catch up with TM Raunak Kulwal, Division B Director and convener for Confluence 2017, for a look behind the scenes. Organizing or event management comes very naturally to me. I got the skill from my family because when it comes to hosting things, we always want to outshine others. The dream of hosting a conference came to me when I attended Orations 2015 in Mumbai. I loved the entire experience and I thought to myself, this is how an event should be done. The persona of the convener really motivated me and I could never have imagined I would be in his place. In 2016, the venue was fixed for Indore but at the last moment, the venue was changed to Goa. We Indoris are very emotional people and it hurt me that because of certain challenges we could not take the conference to my home city. However, these challenges made me strong and determined. During the District Council Meeting in Goa, I stood up and told the members that I wanted to host Confluence 2017 at Indore and my bid was accepted. The vision behind this Confluence is to have a District level conference in a Tier-2 city. We have seen the trend to host such conferences in big cities like Hyderabad, Mumbai, or Pune. The District has for the first time given the opportunity to host in Indore. Coming to the theme, every city has its own lingo and way of talking. For people in Indore, this term is used to denote high praise, something that is above awesome or beyond amazing. When you go around the city, you will hear this phrase said a lot and that is how we first got the idea to do a theme around the city’s lingo. Our aim is to provide an amazing experience for all members. All the delegates who are coming here should have that experience and go back and say that this was the greatest conference they attended. Everything about the conference – food, conference, accommodation, experience, we are planning an ekNumber! thing! First, I work and live in Mumbai so I have to travel frequently to meet the teams. Also, we have only 2 clubs in the city as of now and even though they have great enthusiasm, the membership strength is less. Each member has to work for multiple committees. When we got the opportunity to host, for the first time we got double-digit registrations from Indore to attend the Eloquence Mumbai 2017 to see the conference. People came to see how a District conference is conducted and take those learnings back with them. It can take a toll on me sometimes because I have to guide the teams through and through about their roles and responsibilities. COVER STORY TEAM INDORE amazing platform which has been helping me personally for the last 3+ years and I want to show Indore that same thing. We are coordinating with various colleges and companies in Indore. We are not looking to get anything from them. We just want them to come to the conference and see what Toastmasters is and what value it can bring to them. There are a couple of things we are working on. The Sarafa food market in Indore is quite famous. Our idea is to have some unique experience, not following anything that any other conference has done. On the night of the 24th, we are planning to take the members on a Sarafa night walk. We are also thinking about taking a Heritage tour of the city. Coming to the entertainment segment, there will be something unique, not in the traditional way it is done at conferences. The people of Indore are famous for their love, warmth, and hospitality. Even keeping the theme aside, we want to welcome all members as our guests. Whenever they remember Confluence 2017, we want them to remember this hospitality. Edited and compiled by Karan Take a moment to give us feedback for this article, or the issue HERE. You might get published in Letters to the Editor! Yes, all Toastmasters are entitled to free and fair contests. The Speech Contest rulebook and the general District guidelines help us achieve that to the best possible level for any contest. The alignment of clubs to different areas is not done based on how many contestants the clubs would generate, but on the basis how best the District can help support the clubs to conduct quality and productive club meetings. In the above-mentioned example, the absence or number of other contestants does not affect the result. It is the presence of a well prepared and well-performing contestant that drives the result. Contest formats in Toastmasters are framed based on the best possible solution given the number of constraints related to administration, geography, interest, and reception of the program. You may be right in saying that if you are in a less numbered pool, your chances of winning are high. But who can decide before the contest that the less numbered pool is easy and the higher number pool is difficult? In the less number pool, you may have the next District Champion, while the pool having the maximum numbers may have everybody except one being disqualified or not competent enough. So as a contestant we should all be worried about one thing - “Content is the KING” and focus on preparing the contest and deliver it like a King, irrespective of however many number of contestants you may face. Ravi Take a moment to give us feedback for this article, or the issue HERE. You might get published in Letters to the Editor! consult 300+ entrepreneurs. In one instance, I was able to increase the turnover of a company from 30 crores to 300 crores through my expertise. I was now very sure about my vision and goals. I decided to quit my job and plunge into entrepreneurship. This was not easy though. The company did not accept my resignation seeing my performance and promised to promote me even higher. Now the fire in my belly had risen to another level, nothing could stop my wings and I finally quit after submitting resignation five times. Right now, I am working as a Virtual CEO with four companies out of which one is incurring huge losses. Turning them around requires tough practical decisions. Saying bye to old employees to promote fresh ideas and young leaders for company’s benefit is difficult. The experience has taught me a good amount of emotional intelligence. My vision is to own 400 companies worldwide in different sectors. Right now, I am a partner in “The DK Academy” and own a kiosk in PVR. A bakery and organic farming will find their inception soon. My mission is to generate future leaders across the nation through these 400 companies. I am a day-dreamer and dreams never let me sit idle. I believe that amount of risk taken is directly proportional to confidence. A message to the young, talented, and enthusiastic leaders: “Dream the unseen, walk the unknown and achieve the miracle. The future you see is the future you get.” Edited and compiled by Malvi Take a moment to give us feedback for this article, or the issue HERE. You might get published in Letters to the Editor! channel. Record speeches that can be used for future reference. Publicize the meeting within your organization or community. Learn to improve - Consider your meeting role as a chance to improve and help the speakers. Consider yourself a friend and guide to help them. As an Ah Counter, observe more keenly, or as a Table Topics Master, improvise different ways of conducting Table Topics. Inviting Guests - Your guests are first-timers, who have shown an interest in your club. Make them feel special and clarify any doubts they may have. Make sure you take their details and duly invite them for all Toastmaster programs happening in and around the city. Fellowship - Do not just come to a meeting and disperse. Meet members over tea or lunch. Have regular club outings and meetings at offbeat sites. Try to bond and create a friendly and positive environment. Inform about future meetings - At the end of a meeting, ensure that everyone is informed about the next meeting and invite role players there itself. Also, invite both members and guests for District events and encourage them to visit other club meetings. Conclusion - Conclusion of the meeting is key! Assess each speaker, understand the pattern of mistakes the speaker repeats and advise accordingly. Ask for feedback, check what worked, what did not. Work on the feedback, maintain a feedback register and make sure that everything is noted. These are just a few ways of having an effective meeting. If we all focus on the “The Main Thing” we will find ways to make it interesting so that we have successful meetings in our club and half of our problems will be solved. Let’s all pledge today that we shall set aside at least 30 minutes in our EC meetings to discuss the past and the future of our club meetings. Let’s all pledge to talk about a wonderful speech we heard, an effective evaluation, or an efficient role player. 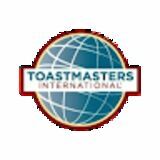 Let’s all pledge once again to recognize and promote the culture of having the best Toastmasters Meetings in our District. Edited by Disha; Compiled by Karan Take a moment to give us feedback for this article, or the issue HERE. You might get published in Letters to the Editor! “Evaluations and competitions help you beat the worst and bring out the best within you!” This is the story of how I realized it. “Mom, it’s good you lost the contest!” my elder son Stefan softly whispered into my ears as we travelled back from the Division Table Topics Speech Contest at Hyderabad this year. Actually, I was expecting him to congratulate me for doing so well and reaching that level of the competition. So what my son said did not go down well with me for some time. But then the words that followed cleared everything for me. “Mom, all this while, you have been in a secure world of admiration from your students and are used to their applause and appreciation. This gives you little scope to discover your areas of improvement and you remain complacent! Now you need to outgrow yourself and challenge your comfort zone.” I introspected and since then, have learnt to break the stereotypical teacher’s image. For this, I am thankful to evaluations in Toastmasters. Evaluations are value additions because you are instructed to continuously improve. Prior to joining Toastmasters in September 2016, I had been running an English Communication and Soft Skills training academy in Nagpur city for more than 25 years. I was always on one side of the table evaluating and training my students from all walks of life. But in Toastmasters, the tables were turned. Here, I was being evaluated as a speaker. My evaluators advised me to experiment with my voice and use different varieties and intonations while speaking. They asked me to fine tune the magic in my voice. which adds a punch to my speech. Playing a dual role of teacher and connector, a mentor can offer their skills and expertise, introduce you to a talent that can fuel your domain and help you get closer to your target audience. My mentor willingly shared her network with me, taking me to events and making introductions that led to many opportunities I would not have otherwise had. Mentors have the experience you can learn from. Manisha made sure I never repeated her mistakes. She was one of the first Toastmasters from our club who completed her CC, CL, and ALB. Even though she is not an active member these days, she still remains my mentor, my saviour, and my go-to person. Having a mentor is not a sign of weakness. It shows you are smart and driven enough to succeed. I feel fortunate to have had this experience and am now in a position to return the favour to others that are just starting out. Edited and compiled by Karan Take a moment to give us feedback for this article, or the issue HERE. You might get published in Letters to the Editor! before my swim, there were a lot of people from all over the world. I interacted with them, exchanging ideas and learnings for my upcoming swimming challenge. And even though swimming is an individual thing, you need interaction to prepare for the journey, both before and after. Swimming transformed me. It made me more disciplined and a better planner. However, it was Toastmasters that taught me no matter how painful things are, good things are always painful. Initially, Toastmasters was painful for me. I wasn’t a good speaker and so on. But it taught me a lot and I grew as a person and I stuck with it. I applied the learnings from Toastmasters to swimming, setting small goals and gradually getting to the bigger ones. You can always find a connection, a learning in whatever you do. If I were to sum up my learning in one line it would be to “Enjoy the Journey!” Because when you are enjoying something, you put in your maximum effort without realizing it. Success is not something easy, you have to work hard for it. Reflecting back, even Toastmasters is the same. I wouldn’t have reached this far if I had quit. Swimming the English Channel was a lonely journey filled with painful hardships. I was alone for 15 hours and 19 mins in the dreadful, cold windy sea. But it made me a humble person, it made me appreciate things and appreciate myself. Edited and compiled by Fatima Take a moment to give us feedback for this article, or the issue HERE. You might get published in Letters to the Editor! BEING PATIENT WILL TAKE YOU PLACES DTM NITEASH AGARWAAL, DISTRICT PR MANAGER, DISTRICT 98 After a lot of hesitation, I joined Toastmasters in 2011. I was blown away by the first meeting. I was excited to speak and take advantage of the opportunity to stand on stage and be seen by leaders of my company. My Ice-Breaker speech was not good enough to be remembered, but the encouraging words by my Site Leader motivated me to discover myself in Toastmasters. Being a Leo sun sign and of the millennial generation, I wanted everything to happen instantly in my career. I had been appreciated for my work repeatedly which sowed an aspiration in my mind to become a Team Leader. It was just 3 years into my career when, in my chat with the Site Leader, I discussed my career aspirations and how quickly I would like to get into the management. The advice he gave me was that I was too young and being patient will take me to places in my career as there is a lot to learn. While I never understood the depth of it but Toastmasters made me understand it. I have served at Toastmasters over the years from a Club Officer to now as a District Public Relations Manager and maybe as a Trio member in future. One thing I realized was how quickly I was able to climb the ladder of leadership something I always wanted to happen with my professional career. But if you ask me today, I feel it would have been better had I slowed down. It's like a 'Been there, done that' feeling. This is when I was reminded of those words by my Site Leader 'Being patient will take you places'. I see that today, the average age of a Toastmaster is around 45 across the world. But in India, it's 25-35 and moving towards 20-30. While it's a good sign of people learning public skills and experiencing leadership at such a young age, it's also impacting the organization as we are seeing an influx of immature leaders who are reaching to the top serving positions so quickly that it's affecting the functioning of Toastmasters. Also, it is leading to an expectation gap between these generations as their ideology towards looking at one subject is so different. Whereas on one side, we see experienced leaders believing in ‘Slow and steady wins the race’, younger leaders believe in ‘instant implementation without thought’ which has the following problems: > Damage due to their decisions is irreversible > Lack of commitment > Keeping bad company > Blaming others Overall, I am happy to have experienced so much in Toastmasters but the thought of slowing down should a person get into a leadership position quickly always keeps me wondering. Edited and compiled by Prathima Take a moment to give us feedback for this article, or the issue HERE. You might get published in Letters to the Editor!